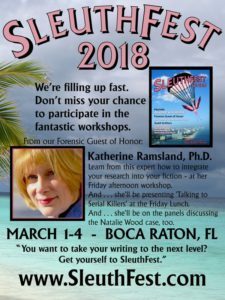 Posted on February 17, 2018, in editing, Florida, Heidi Wilson, location, Mystery Writers of America, Plots, Revision, Uncategorized, writing, writing conferences and tagged backstory, conflict, Freddie Awards, MWA, place, Sleuthfest, spell check. Bookmark the permalink. Leave a comment.